I think it's either faulty , or the synchronization with the health app on your phone is failing. The only fault I have discovered with this device though is the strap falling out but was simply fixed with some glue. Many thanks. I think I will return it. OK - will do. Have unpaired and paired and also loaded H Health app through Aptoide. Will try updating as well. Thanks. Hi. I bought the Band 2 Pro 14/09/2018. I too have sleep tracker problems. It has been working fine but last night, and the night before, it only recorded 2 or 3 "naps". It did have problems with the step count over the day the hour changed (it added both days together for the Sunday count), but that has settled down again. I think you need to have a set number of hours undisturbed sleep for it to register as sleep and not a nap. I appreciate that, but last night is says I napped 22:01-22:30, 22:31-23:12,23:13-00:12, then nothing at all for the rest of the night. It now thinks I also napped between 13:43 and 14:00, when I was actually reading. Joehamster9 I have exactly the same problem. Started on 5th of December. 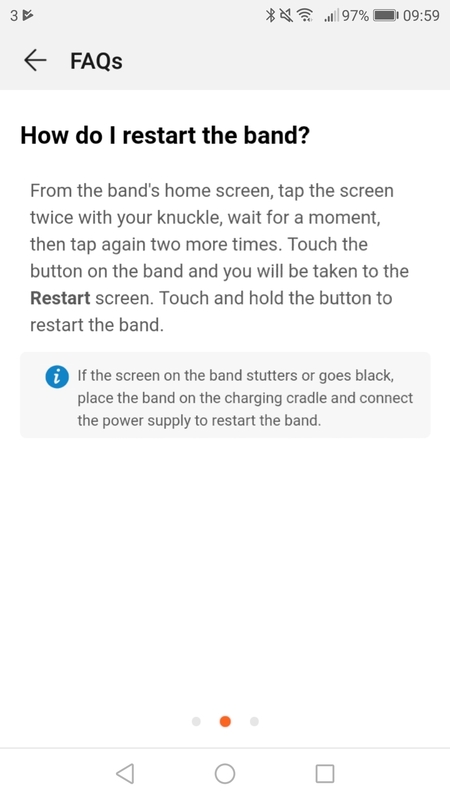 Don't know yet if it helps but it's possible to restart the wristband. When you get into the restart menu it will show a lot of country names and numbers etc just keep tapping the button until you see restart then tap and hold for couple of secs and it's done. I have just done it now (morning) so need to sleep again to see if it makes any difference or not. through the night but I get no results on the sleep tracker. If you are having problems with the sleep tracker please uninstall and reinstall the app. Make sure your app is up to date. Next unpair and repair the band to the phone and make sure that the app has all permissions enabled. Please test it and let us know how its behaving afterwards. OK, I have done all of the above. The last time I had any believable sleep data was 16th December. 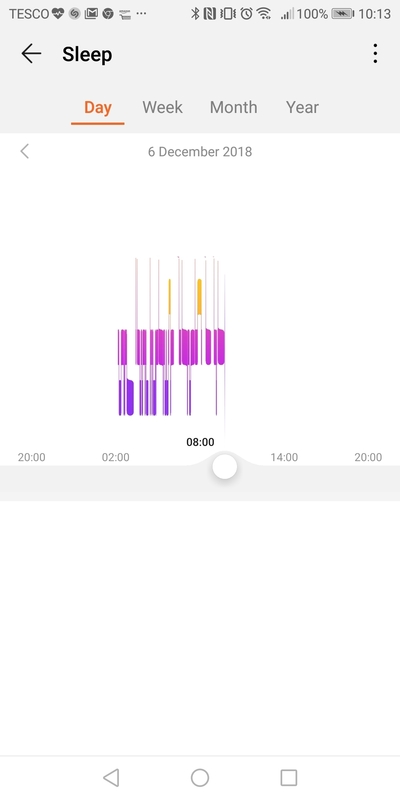 Since then it has been only reporting really low sleep, like 2 or 3 hours - which is not the case, only naps - again not the case, or no sleep data at all. Will I have to wait until tomorrow to see if this has solved the problem? OK, heart monitoring worked fine all night, but still no sleep data. i'm gonna have to send it back. Hi Amy, It would appear I only had a 26 minute nap last night. Really disappointed now, hope you can get this sorted. Hi, Ive been using a Band 2 Pro for 10 days now and it's not downloading Sleep data from band to Huawei apps! I cleared the caches of both apps after 2 days and got 2 days worth of data to the apps but since then nothing! The band is capturing the data but not downloading it! I've cleared cache, re-paired the band, restarted the band, even re-installed both apps but still only get the 1st 2 days of data......! I've emailed Huawei customer support but got no reply! This seems like a common problem, any ideas how to fix it??? I wish I did. Mine has decided I take a nap during the night, nothing more. It has also stopped reliably recording cycle trips - I now have to use the app on my phone for this. Very disappointed at the lack of response from Huawei. If you are still facing these issues with your bands, can you please PM the serial number of your bands so I can look into this further? You can find this info on the back of the band or on the box. I did 4 days ago - is there any progress? I have Huawei Band 2. For now all functions well. Last night I got out of bed to have a drink but that did not register as waking up. Why is that? After a few messages back and forth with Max it turned out my device was intended for the United Arab Emerates market. I contacted Amazon.es, where I bought it, and they immediately arranged for a replacement. Using the serial number checker Max kindly provided I was able to check that this one was for the European market. I received it on Wednesday and so far, so good, so thanks Max for your help. Maybe providing the serial checker here may help a few others having problems?